CHATRA, Bangladesh, Feb 5 2018 (IPS) - Just before sundown on Jan. 30, a group of women day labourers from the Shantal indigenous community are in a rush to wind up their work harvesting potatoes in a field in the village of Boldipukur, some 15 km away from Rangpur district in northern Bangladesh. One young girl looked indifferent and didn’t seem to be in a hurry to go home. When approached by IPS, she gave her name as Rupali Tudu. Her father died of an unidentified disease some six years ago and her mother is depressed and suffers from mental instability. There is no one to help her earn a living, so she has no option but to work as a day labourer on others people’s farms in the village. Although Rupali, 14, is enrolled as a ninth grader at a local high school, she cannot attend regularly. 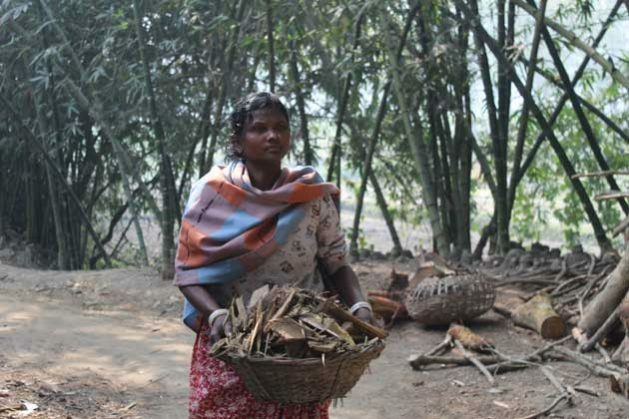 Her eyes tear up when she states that many children of the Shantal community in her village drop out of school as their families are extremely poor and they are obliged to work as manual labourers. Chatra is a village with an area covering 8 sq km in Pirganj Upazila (Sub-district), some 25 km to the south of Rangpur city in Bangladesh. There are about 10,000 people living there including 2,000 members of adibasi (indigenous) community, mainly Shantal. 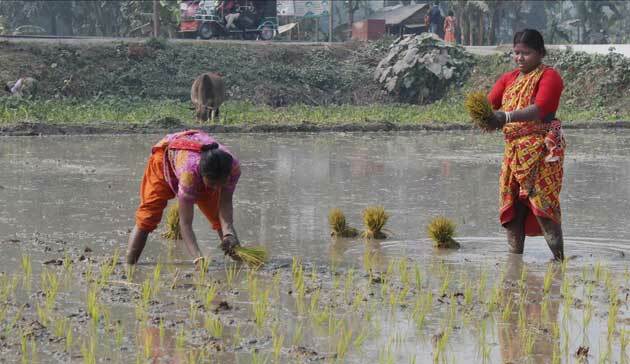 The principal occupation of the villagers is agriculture. Potatoes and other vegetables grow abundantly in Chatra as well as in Pirganj. According to statistics from the local government, 90 percent of the Shantal community in Chatra does not own any land. Men, women and children of the community earn their livelihood by working on others’ lands. According to the findings of Network of Non-streamed Marginalized Communities (NNMC) Foundation, a platform for the ethnic communities of the North-West of Bangladesh, the school dropout rate among the ethnic communities at early primary level is 33 percent. Michael Kispotta, 68, a former teacher at Boldipukur High School and also a member of the Orao community, tells IPS that at least 80 percent students belonging to the ethnic community drop out of school in the secondary level. Kispotta says language is one of the major barriers for the ethnic children to go to school. Their communities don’t understand, read nor write Bangla (the language of Bangladesh people) and are therefore reluctant to attend classes. Thus isolated, a majority of the community remains illiterate and cannot keep pace with the fast development taking place in Bangladesh, which is becoming a low middle income country. The Oraon, as well as other ethnic communities of the plains, remain extremely vulnerable, socially, economically and politically. At least 25 languages are spoken by the 54 indigenous communities of Bangladesh, where 80 percent of the indigenous peoples live in the plain land districts of the North and South-East of the country and the rest in the Chittagong Hill Tracts (CHT) area. Leaders of the indigenous communities state that under the existing education system, their children do not have the possibility to receive education in their mother tongue. From early childhood, they are required to learn Bangla and follow the national curriculum which is related to Bengali culture and society. The instructors are mostly Bengalis. This leads to problems in understanding of the curriculum, as Bangla, to many indigenous students, is a foreign language. The NNMC Foundation, a non-profit voluntary organization, works with plain land indigenous or ethnic communities in Rangpur (Central north) and Rajshahi (North west) division where at least 28 ethnic communities live. She also emphasizes the need of a localized education system for the indigenous children based on their societal system and distinct language so that they can conceptualize their own society with the Bengali society. The Bangladesh government has already introduced indigenous language as a subject in the pre-primary school curriculum for Chakma, Marma, and Tripura in CHT in the Southeast and Sadri and Garo in the Northeast of the country. The students of these indigenous communities learn their own language in the pre-primary phase. The indigenous children in the plain lands are yet to get books in their own language. Officials with National Text Book Curriculum Board of Bangladesh confirmed to IPS that language learning books for the indigenous children in the plain lands are being developed and will be introduced to the children soon. IPS also spoke to Bivuti Bhusan Mahata, former chair of Indigenous Student Council, Bangladesh. Bivuti, a student at Rangpur Begum Rokeya University, says no more than 1,000 indigenous students go on to university each year. Considering that indigenous groups are the most disadvantaged communities in the country, government should take up the national strategy to push them forward, Bivuti observes. Rabindranath Soren, President of Jatiya Adibasi Parishad (National Indigenous Council) in Bangladesh, told IPS that learning indigenous languages will help the ethnic communities keep their individual identity as distinct tribes or ethnic groups but it does not guarantee their social, economic and political rights, which are the major challenges for their empowerment. “For these we need state’s comprehensive and coordinated efforts,” said Soren, also a member of the Shantal community. In Bangladesh, there are about 48 different indigenous communities living in the plain lands (central north and northeast) and hill areas (southeast). Only 30 of these communities are on government records. Though they claim that their population is over 3 million, the government numbers are different. According to the National Census of 2011, the country’s indigenous population is around 1,586,141, which signifies 1.8 percent of the total population. Rabindranath, who has long been in the movement for the rights of the indigenous communities, has identified those in the plain lands as Shantal, Oraon, Munda, Malo, Mahali, Khondo, Bedia, Bhumij, Kole, Bhil, Karmakar, Mahato, Muriyar, Musohor, Pahan, Paharia, Rai and Sing. Rabindranath says only six are in the government records. “Defeated in the struggle against adversities, a few of the indigenous communities are almost on the verge of extinction,” Rabindranath told IPS. He wondered how they can establish their rights when the government does not acknowledge their existence. The Bangladesh Bureau of Statistics (BBS) shows that among the existing ethnic communities in the plain lands, Shantal is the largest with about one million people. After Shantal is Oraon with half a million. Leaders of the plain land indigenous communities claim that until now, the indigenous people haven’t been consulted and engaged in the process of National Action Plan for the implementation of the Sustainable Development Goals (SDGs) which is currently being developed, although a meaningful engagement in national development is one of the major goals of the United Nations Declaration on the Rights of Indigenous Peoples (UNDRIP). Also, the spirit of the sustainable development agenda 2030 is “leave no one behind”. In its seventh Five-Year Plan, the government of Bangladesh expressed its “strong commitment” to consider implementing UNDRIP and ratifying ILO Convention no. 169 on Indigenous and Tribal Peoples. Almost the same words were used in the sixth Five Year Plan. “Unfortunately, no significant changes have been noticed on the ground. We want to believe that this time the government will come forward to make good on its promises,” Subin Chandra Munda, Secretary of National Adibasi Porishad, tells IPS. Munda says the indigenous people must be engaged in the SDGs, their voices must be heard, and their rights must be respected, protected and fulfilled in the spirit of the UNDRIP. The indigenous peoples of Bangladesh with their distinctive identities still continue to feel marginalized, protesting against land grabbing, corporate greed, forestry and energy projects on their inherited lands.